Songbirds Declining…. This Could Be Why! For me, everyday at TWRC is a learning experience. I recently saw a post on our Facebook page about a Cowbird and a Cardinal hatchling sharing a nest. I was intrigued so did some research on this and I think you’ll find it as fascinating as I do. The Brown-headed Cowbird is called a “brood parasite” because they don’t bother to build nests but rather lay their eggs in the nests of other songbirds. The female will watch other birds who have nests and when the other female is away from the nest, the cowbird will lay one or two eggs in her nest. The cowbird female may even go so far as to damage or push out some of the other eggs to make room for hers. The cowbird lays an average of 40 eggs per season. The host birds then raise the cowbird chicks as their own. Cowbird eggs have a relatively short incubation period and often times hatch sooner than the other eggs. The chicks grow quickly and are usually larger than the others so they can command most of the food. They demand a lot of attention from their foster mom and therefore the other chicks often get neglected. 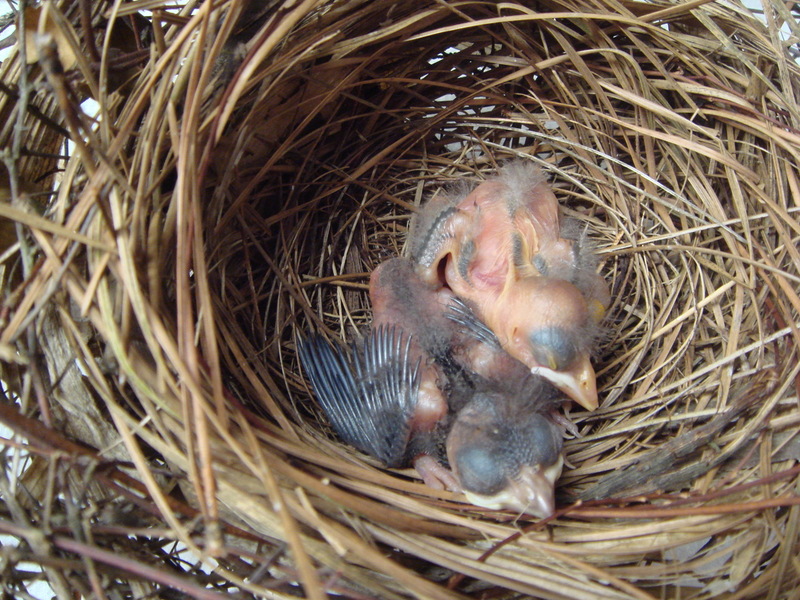 The cowbird chicks have even been known to push the other chicks out of the nest. This is perhaps one reason the songbird numbers are declining. The Yellow Warbler is one species that has learned to recognize cowbird eggs. Most often, they will build a new nest on top of the oddball egg. New evidence suggests that some bird species that recognize the cowbird egg in their nest will accept it to just to avoid total destruction of the nest by an angry cowbird. The Brown-headed Cowbirds are native to the US and are a member of the blackbird family. The adult male has a metallic green-black body and a brown head and are about 7.5 inches long. The female is slightly smaller and is dull grey with streaking on the underside. They can be found throughout the United States. TWRC Wildlife Center is a 39-year-old non-profit organization located in Houston, Texas. We are your resource for help with wildlife issues. Check out our website at www.twrcwildlifecenter.orgor give us a call at 713-468-TWRC.